Fit Fluential Mom: Lose 1-3 lbs a Week With These Minor Changes! Do you want to lose weight but just don't have the time or effort to make the necessary changes? Have you tried many diets in the past and failed? Do you refuse to cut out certain foods? If so, try making small, sometimes inconspicuous changes, to your daily lifestyle. It can help you burn hundreds of extra calories per day without doing much at all. Make all of the changes below and you could lose 1-3 lbs a week! 1) Eat breakfast every day! 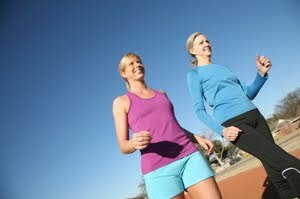 Get your body burning calories immediately and keep yourself from snacking on processed foods all morning until lunch! Try to eat at least 200 - 300 calories of a balanced breakfast with plenty of fiber & protein. Avoid bagels, donuts, croissants or fast food breakfasts. Try cottage cheese, oatmeal, low sugar yogurt, fruit, nuts and eggs. All of these foods are easy to pack and take to work. They will also provide the nutrients and energy you'll need to make it to lunch time! 2) Add lemon to your water! It has been said by many that the acid in lemons will help burn a few extra calories as you drink your water! Even if it doesn't burn many, it will make your water taste better so you drink more of it! Truth? Nice in theory, short in practice. Nobody is losing fat with ice cold water. If it sounds too good to be true - you know the rest of the story. 3) Eat 2 whole eggs per day. Whole eggs are a much more viable source of protein because, when the yolk and whites are eaten together, they are more easily digested and absorbed by the body. The egg yolk is also the part of the egg that contains all of the nutrients, 90% them to be exact. The yolk contains a wide array of vitamins and minerals including Vitamin A, D, E, K, B6, B12, zinc, thiaminecalcium, iron and phosphorus. Eating eggs as a part of your breakfast will give your body the vitamins and minerals it needs, along with protein to keep you full through lunch. This should help prevent snacking and help you save a few hundred calories along the way! 4) Eat cottage cheese daily to get your daily dose of casein. Low fat cottage cheese has lots of healthy milk protein, including casein. Casein helps the body absorb sugar and other proteins at a slower rate, preventing a large, rapid insulin surge. This, in turn, helps prevent excess weight gain and makes cottage cheese one of the best fat burning foods around. In addition, the yolk also contains lutein. It's an antioxidant also found in leafy greens such as spinach. It's responsible for slowing the thickening of the arteries that often leads to heart disease. 5) Drink at least 64 ounces of water, if not more! Drinking water not only hydrates your body but it also helps it digest food much more efficiently.. Try to drink at least a cup of water before a meal and continue drinking through your meal, every few bites of food. You'll get full much faster and, if you opt for water instead of soda, alcohol or juice, you'll save hundreds of calories! 6) Take the stairs instead of the elevator wherever you go! The average American woman burns approximately 7 calories per minute climbing stairs. Not only will you be burning calories, you'll also be working your leg muscles and help keep them toned and firm! 6) Go for a walk after dinner each night. Getting moving after you eat, as opposed to sitting on the couch for some television time, will help your body digest food much more efficiently. It'll help prevent heartburn, acid reflux and burn a few extra calories at the same time! 7) Buy in bulk to save money and calories! Those 100 calorie packs can get expensive. Not only that, they are usually high in sugar and carbohydrates, although they are only 10 calories. Instead, purchase bulk items and healthier options of foods. You can choose from raisins, pretzels, almonds and many more snacks that will be much more nutritious than a 100 calorie pack of Chips Ahoy! When you buy in bulk, instead of eating out of the large package, separate snacks into serving sizes to avoid overeating. Buy snack or sandwich bags and measure out your servings so that you are aware of how much your eating. When you're done, you can refill the bags. increments. Wear a pedometer if it'll encourage you to walk more each day. Even those steps from your car to the mall entrance count towards your 30 minutes of recommended daily activity so why not make the most of it! (9) Sit in a stability ball instead of a desk chair. Not only will this improve your posture and help prevent slouching, but it will also help strengthen your core. By sitting on the ball, your body must continuously make adjustments in muscles throughout the core to remain upright and balanced.. The abdominals, gluteals and leg muscles will all be working as you sit at your desk to keep you upright. It's like getting a work out while you're at work at your desk! Many report noticing dramatic improvements in balance and stability soon after making the change from office chair to stability ball. If you suffer from lower back problems and/or your office doesn't allow the use of stability balls as chairs for liability reason, try using a Fit Disk on your chair. It works in the same way as a stability ball, however, it fits on the seat of your chair and you sit on top of that. (10) My favorite calorie burning activity is playing with my kids! Running around the house playing tag, riding bikes, tossing a baseball, swimming and more burns tons of calories, sometimes more than going to the gym! Not only will you be getting your exercise in and burning calories, but you'll also be spending quality time with your kids. Getting the kids up and moving will also help them get their exercise in. It'll keep them from doing what most kids do....spend time playing video games or surfing the internet. Nice site. I am following you from MBC.